Retailers are reporting some of the weakest sales in more than a decade as consumer spending dried up in October amid the uncertainty brought on by the financial crisis and mounting layoffs. With the disappointing results coming on the back of dismal sales in September, the outlook for holiday sales is growing gloomier. As consumers stuck to the bare essentials and looked to stretch their budgets, Wal-Mart Stores (NYSE: wmt) emerged as a clear winner, topping sales estimates for October. BJ's Wholesale (NYSE: BJS) also topped analysts estimates, but far and away, retailers were falling short of estimates, with Costco Wholesale, Limited Brands, and many others falling short of estimates. According to Thomson Reuters, 56 percent of the retailers it tracks have fallen short of analyst estimates, while 41 percent have topped those expectations. Overall, Thomson said sales for the month of October fell 0.7 percent, which was worse than the 0.3 percent decline analysts had estimated ahead of the results. Some of the steepest sales declines were seen at department and speciality stores. Saks (NYSE: sks) reported a 16.6 percent drop in sales, Macy's (NYSE: m) a 6.9 percent decline, Nordstrom (NYSE: jwn) dropped 15.7 percent, and J.C. Penney (NYSE: jcp) a 13 percent decline. The weak results prompted some retailers such as American Eagle to lower forecasts, while others such as AnnTaylor Stores expanded cost cutting efforts. Consumers who are already under pressure from high food and fuel prices and a crumbling housing market found themselves in an even worse off in October, and many opted to only buy the things they needed and even then, they wanted the items on sale. "We're all one degree removed from somebody who has lost a job," said FBR Capital Markets analyst Adrienne Tennant. Indeed, as the weak results rolled in, a government report showed the number of people continuing to receive jobless benefits reached its highest level in more than 25 years. Wal-Mart's relatively strong sales can be attributed to the retailer's decision to stick with its value message. For example, Wal-Mart has been airing television commercials that discuss the ways a family of four can save about $700 a year by shopping for groceries at Wal-Mart. Wal-Mart said its same-store sales, which track sales at stores open at least a year, rose 2.4 percent without fuel prices. The increase topped Wal-Mart's predicted range for the month, which had estimated a sales gain of 1 percent to 2 percent, as well as analysts' estimates, which had projected 1.6 percent gain, according Thomson Reuters. The company said customers are shopping more frequently at its stores and its customer traffic has improved. JPMorgan analyst Charles Grom attributes the pick-up in store traffic to consumers who make more money trading down to Wal-Mart. "Wal-Mart's got a big opportunity here to gain share from people making greater than what their core customer typically makes, which is close to $40,000," Grom said. To reinforce the "value" message heading into the holiday shopping season Wal-Mart unveiled a new plan, dubbed "Operation Main Street" to make additional rounds of price cuts every week until Christmas. This effort builds on the discounts it already put in plans on select toys in October. The world's largest retailer is now forecasting November same-store sale to rise between 1 percent and 3 percent. "While there remains some uncertainties with the global economy, we believe falling gas prices could help customers as we enter this holiday season,'' Chief Financial Officer Tom Schoewe said in a statement. BJ's Wholesale, a warehouse clubstore, also benefited from bargain-hunting consumers, with a 10.2 percent increase in October same-store sales. That put it solidly above the 6.3 percent gain seen by analysts. Still, rival wholesale club operator Costco Wholesale reported a surprise decline in same-store sales Thursday. Target, another discount retailer, also posted very disappointing sales. Costco (NASDAQ: COST) said same-store sales fell 1 percent. Analysts surveyed by Thomson Reuters predicted a rise in same-store sales of 3.6 percent. U.S. sales rose 2 percent last month, while international sales tumbled 10 percent, hurt by foreign exchange rates. 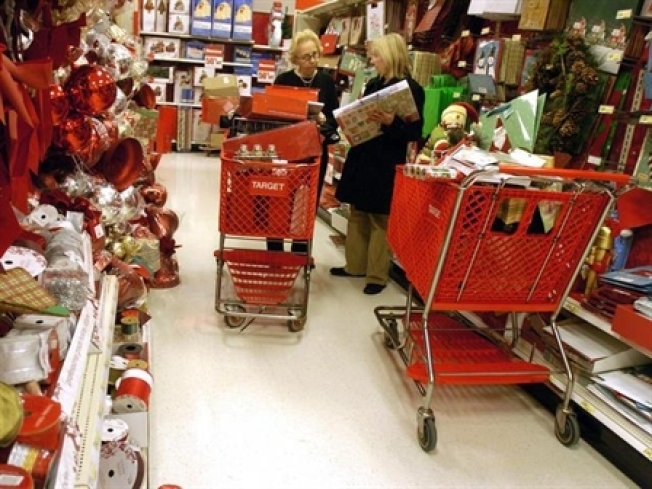 Meanwhile, Target (NYSE: tgt) same-store sales fell 4.8 percent. Analysts, on average, had expected the same-store sales to fall 2.8 percent, according to Thomson Reuters. "Sales for the month of October were very disappointing, with continued volatility in daily results," said Gregg Steinhafel, president and chief executive officer. TJ Maxx (NYSE: tjx), which also operates discount stores TJ Maxx and Marshalls, said its sales fell 6.0 percent, compared with a 0.8 percent decline estimated by analysts. Dana Telsey, of Telsey Advisory Group told "Squawk Box," said she expects the trend of negative same-store sales to continue through the end of the year, with the only bright spots being Wal-Mart and dollar stores. Overall, department stores and specialty retailers are expected to be the worst hit. This held true as some of the biggest misses relative to analyst estimates occurred at specialty retailers Zumiez, Abercrombie & Fitch, and Gap, according to Thomson Reuters. Gap (NYSE: gps) sales fell 16 percent, much wider than the 11 percent decline analysts were estimating. Meanwhile, sales at Zumiez (NASDAQ: zumz) fell 13.1 percent, compared with the 6.5 percent decline projected by analysts. Teen apparel retailer Abercrombie & Fitch (NYSE: anf) said same-store sales dropped 20.0%, outpacing the 14.4 percent decline forecasted by analysts. Bucking the trend in the specialty retail sector are American Apparel (AMEX: app), which posted a 22 percent sales increase; The Buckle (NYSE: bke), which reported a sales gain of 14.5 percent; Children's Place (NASDAQ: plce), which posted a sales gain of 4 percent; aMother's Work, which saw sales rise 6.0 percent; and Hot Topic (NASDAQ: hott), which posted an increase of 8.3 percent. Separately, Talbots (NYSE: tlb) shares fell after the company said it would sell its J. Jill clothing brand and withdrew its earnings outlook. Talbots, which is majority owned by Japan's Aeon and been going through a restructuring, said it wanted to focus solely on rejuvenating the namesake Talbots brand, given the current economic weakness. Talbots' restructuring includes new management, new merchandise and closing some businesses. The company said efforts to refresh its namesake brand were showing some effectiveness, based on the response from its existing and previous customers.